Werner Herzog is a legend in the film world. Having made around 50 films, whether fiction or documentary, he is known for grueling shoots and a take no prisoners attitude. One of his early films actually had a group of people carry a ship up a mountain; the guy gets what he wants and as a result usually has some great stories or even a film about the making of his epics after their completion. Supposedly his new narrative tale, Rescue Dawn, is no exception. I have not heard much, but I have gleaned that the shoot was a bit trying for all. After seeing how wasted away some of these actors were, you can imagine that they were put through the process as though they really were prisoners of war. We have a realism that isn’t common in many films of this kind—there is dirt, violence, maggot consumption, blood, death, and comradery. If nothing else, this story is a love letter to Dieter Dengler, the man for whom it is based and the focus of Herzog’s 1997 documentary on his life. 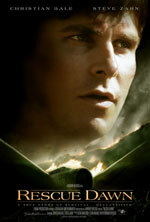 Rescue Dawn is a heroic journey of the heart and mind to never give up and to survive at all costs. This movie is very deliberate and methodical in its construction. There are many scenes shrouded in silence while the camera tracks our characters or the jungles of Thailand, filling in for Laos. While calm and serene in scope, these quiet moments just help to amplify how alone our POWs are in the world. Starving to death and tortured, they are waiting for the opportunity to escape and run for sanctuary and rescue. Their captors are mostly vicious creatures, prone to abusing the Americans each time a plane flies by as though they have called it over. However, while the prisoners are hungry, so are the jailers. It is only a matter of time before opportunity strikes and an escape can be hatched. The main portion of the film is the time in captivity with a bunch of guys that have all but given up hope after the two or so years they have endured already. Once Dieter arrives with his hope, vigor, and ideas do the others start believing in life again. Herzog does a wonderful job at getting the mood correct at this time, juxtaposing the hope against the solemn, defeated mentality that was prevailing. The reason we can sit through the tortures and the terror of not knowing whether they will all make it out alive is in the bookending Herzog gives us. Our entry point to the film is at the start of a mission to bomb specific targets in Laos, before the Vietnam War really turned into one. The jokes and attitudes of the soldiers are welcoming and an enjoyment to watch. It really gets you into the film with a smile, helping to make the transition to survival amidst horrible forces easier. Even at the end we are given some more laughs, getting us out of the morose mood we have been lulled into during the bulk of the movie. It is good to see Toby Huss, as Spook, in the middle of it all, instigating the humor. Old Artie from the brilliant “Pete & Pete” adding some needed comic relief to an otherwise serious drama. The ending never seemed contrived or easy either, every moment is true and right in the full scheme of things. All the landscapes and realism in environment mean nothing without the people to make it all work. Whom I assume to be mostly untrained actors in the Viet-Cong roles, all do a very good job. If anyone can handle amateurs to work professionally and realistically it is Herzog. This is, afterall, his first film with a predominately English speaking cast. He is used to taking the locals under his wing and letting their real life experiences infer on their performances. However, it is our three American soldiers that keep the story glued together. Christian Bale, Steve Zahn, and Jeremy Davies have all taken the plunge into darkness and stayed there to make the story perfect. Credit must be given to both Davies and Zahn for allowing themselves to waste away to skin and bone, but they are starved for the entirety of their roles. It is Bale who actually transforms before our eyes from healthy fighter pilot to beaten and worn prisoner. The guy is possibly the best actor working today, yet his utter disregard for his body at the need of his dedication makes you wonder how long he can keep it up. Going through the weight changes that he has the past five years or so would reek havoc on anyone. Hopefully Bale knows his limits and doesn’t continue to push them to the point where he can no longer perform. Davies shows why he needs to be used more in Hollywood. The guy can act and has not shown me a bad performance yet. Usually the mousy, nerdy kid, he transforms himself into a slowly degenerating soldier both physically and mentally. Despite his skeletal appearance he still is able to give a piercing stare to strike true fear in those he is at odds with. Bale is superb, as always, with his infectious smile coming out during even the hardest times, pulling his friends together to continue their journey to freedom. Yet it is Zahn who really shows poise and professionalism. Mister Funnyman himself is nowhere to be seen in this beaten man, reduced to an infinite fear for all that is around him. With what is no question his best acting to date, Zahn encapsulates the man with whom nature and external forces have come down on too quick, and no matter what glimmer of hope he can still see ahead, it just might not be enough. 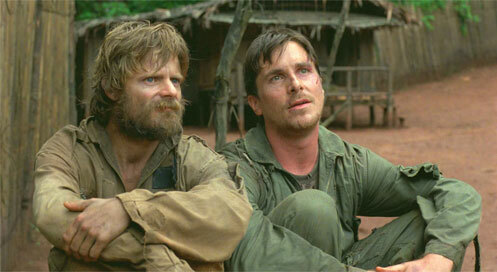 Steve Zahn, Christian Bale. Photo by Lena Herzog. © 2005 TOP GUN PRODUCTIONS, LLC. ALL RIGHTS RESERVED. 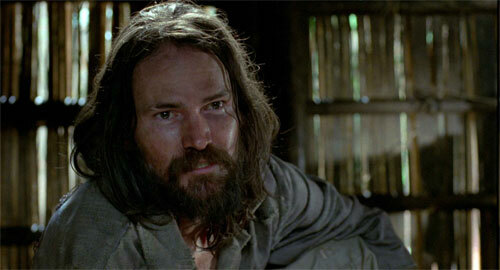 Jeremy Davies. Photo by Lena Herzog. © 2005 TOP GUN PRODUCTIONS, LLC. ALL RIGHTS RESERVED. 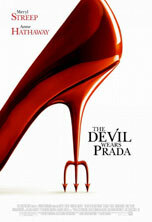 I guess this is the sign of what America likes to read, being that The Devil Wears Prada was based off of a best-seller. People must enjoy their books light and fluffy, convenient and contrived. Well, it doesn’t really surprise me, as most of America likes the escapism and ability to spend time with something that doesn’t take too much brainpower to follow. Now, I could be totally off base here, but if I am, it doesn’t excuse the fact that the movie adaptation is all the things mentioned above. Also, from experience, I know Americans definitely like their movies as low maintenance as possible, so it is no surprise this film did so well. It is a shame though, because there are some nice performances and some moments that truly work, too bad there were also many that did not. 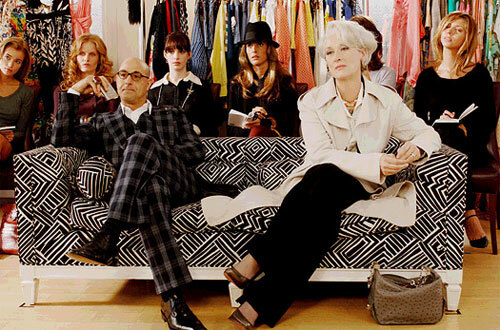 We have the fish-out-of-water tale of a young girl getting a job with the country’s most esteemed and vicious fashion critics. Now I understand she was hired because the critic wanted to prove a point with her old assistant, but come on, there is no possible way this girl with no fashion sense and a bit of an attitude against authority could be hired for the job. However, sometimes it is good to have someone on board with a fresh look, so I can suspend disbelief here. Our girl slowly grows into her job, neglects the people that mean the most to her, and begins a journey down the path of a cutthroat career girl doing what is necessary to get ahead. Of course we will be given the obligatory “a-ha” moment where she sees what has gone wrong with her life and how she has changed those around her for the better, but even with that knowledge, I still wanted to enjoy what I was watching. I wanted to have fun with the ride no matter how easy the plot was progressing and how obvious. Unfortunately the characters didn’t keep up appearances and some moments were just laughable at how specifically simplistic they were. Give credit to Anne Hathaway for actually giving us what we expect from her role. It is pretty much a rehash of the exact same part from Princess Diaries, but hey, she does the ugly duckling to gorgeous success well. How Hollywood can continue to get away with casting an attractive girl in these cases and call them fat before the transformation, I have no idea. As for the rest of the cast, the real standout comes from Stanley Tucci who steals absolutely every second of screen time he has. The guy makes anything he is in better and no matter how bad the role, finds a way to redeem it. As far as writing goes, he is given all the great one-liners and nails each and every one, (whether I should applaud the author or screenwriter, I don’t know). Our other two leads, Emily Blunt and Meryl Streep, just did not work for me. I have heard all this great press for Blunt and how her breakthrough performance was top-notch. In my opinion, her character was underdeveloped and a pawn used for the sole purpose to help show Hathaway’s rise up the ranks. When the tug of war is no longer needed, she completely disappears from the film because she wasn’t needed for anything else. I’m not saying she was bad, I’m just saying the part was a throwaway one. Benicio Del Toro’s small role in Swimming With Sharks was more fleshed out and it lasted maybe five minutes, (Sharks, by the way, is a similar tale—a lot darker and sadistic—and much, much better). As for Meryl Streep, what can you say about the acting? The sweet monotone voice while she is turning the knife in the back of all those around her is spot-on, but again, the role just doesn’t live up to the evilness necessary and expected. Until her final revelation of espionage, she really wasn’t all that bad. Nobody really hated her, Tucci and Blunt continuously defended her and even Hathaway spoke about how she was just real good at her job, and if she were a man, no one would say a thing. Where was this monster I wanted to see? Now, when it comes to contrivances, you don’t have to look far. A friend is trying to make a name for herself in the art world and Hathaway’s lust-interest just happens to be there to show the burgeoning love triangle? I don’t want to give anything away, but could the car crash have been any better timed as far as tough decisions go? What could have been a nice confrontation between assistants ends up taking place in a hospital without any of the fireworks that would have happened in real life. Also, how about Hathaway always meeting the precisely right person needed at every party/event? If there is a problem for her to solve, she just happened to have been introduced to the person that can solve it five minutes before. It was all just too easy; I couldn’t stay bought in for too long before I was jarred back into the reality of it all. I will say, though, that the ending moments were well done and worked in the grand scheme of things. Through everything, the job did make a difference in our lead’s life, and the quick moments with Streep and Blunt at the conclusion were nice to see. 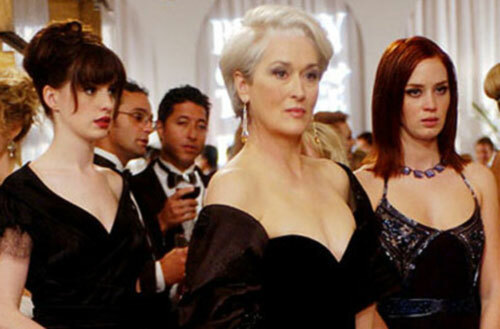 Left to Right: Anne Hathaway as Andrea, Meryl Streep as Miranda Priestly and Emily Blunt as Emily in Twentieth Century Fox Film, The Devil Wears Prada. I love Danny Boyle’s work. Sure I haven’t seen The Beach or Shallow Grave, but I can’t see myself thinking they will be anything less than fantastic because he has never let me down. The man has spanned genres and never shied away from doing something different than before. Between his visual flair, either aesthetically or kinetically, and his brilliant choices in screenwriters to collaborate with, Boyle astounds at every turn. 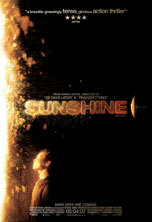 His newest film Sunshine just enhances his oeuvre even more, bringing out, what in my opinion is, his finest achievement to date. This sci-fi thriller is equal parts 2001’s psychological quandary, Event Horizon’s supernatural foreboding, (although not as integral to the final act as some detractors of the film say it is), and Sphere’s stir crazy cabin fever—with a little Armageddon bomb in space world saving. Sunshine is a feat in technological expertise, sci-fi rhetoric, visual beauty, and an acting clinic from its ensemble cast of actors better known for supporting roles in the past. 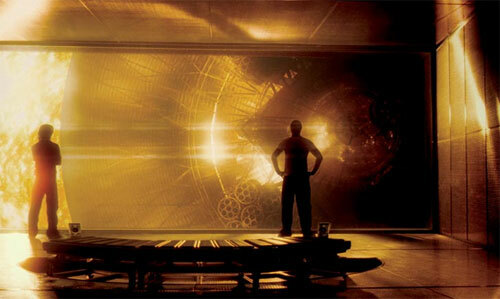 Writer Alex Garland has crafted a story pitting man vs. God/science vs. creation. While I agree with this point as many have discussed, I don’t agree with the simplicity of it. People have been pointing out that this is a tale of Atheism since how can we mortals take our lives in our own hands by using science to resurrect the sun? If God has called time on our existence, wouldn’t it be our utter disregard for his own being to decide to go against his will? I refuse to believe the film is as simple as that because of all that is shown through its duration. For one, if we are to accept Greek mythology, it was Prometheus who gave us fire against the will of Zeus and to his own demise of infinite torture at the hands of vultures. The Gods have been fighting as far as how to handle us humans and if they had to take sides to fight for our survival, can’t we always fight against those Gods that have said our time is up? Also, if God created us with the mental capacity to create science and ways to go against nature, isn’t it his will to rise up to his challenge and fight? We are given many moments of religious epiphany as well, at the hands of the Icarus II’s crew. These are the men and women risking their lives to save Earth and make a new star within our dying lifesource. Therefore they are supposed to be the atheists blatantly disregarding the clock of our existence’s final chime. By looking at the sun through their ship’s observation deck they are putting themselves one step closer to that God which they believe in. The sun’s rays, which bath the deck with light and encompass those watching, become a shower of God’s love and mesmerize those sitting before it. However, while this is true for people like Searle, the ship’s psychiatrist, and Kaneda, the ship’s captain, it is not for Icarus I’s captain Pinbacker. While watching the video logs of their predecessor’s mission’s demise, we find that the old captain had an epiphany of God’s will and decided to allow the sun’s rays to consume them and turn them back into the dust from whence they came. The power held inside the sun is both life and death depending on one’s deepest beliefs. What is killing humanity and putting them into nuclear winter is also the only hope they have left for survival. The story is, for lack of another word, simple at its core. While the sun dies, so does life on Earth. 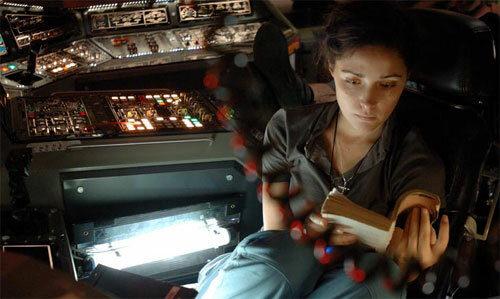 After a failed attempt to create a new star with physicist Capa’s stellar bomb, he and a new crew mine the Earth of its final resources to construct one last bomb to do the job. They take flight on the two-year journey to the sun in order to drop the payload and fly back home hoping the bomb works and creates a new sun. The actual plot then, is the final leg of the journey to the sun and their attempts to succeed with the mission while also surviving themselves to see what their bravery has wrought. It is only when they discover the Icarus I on their way do they begin to question morality and the sacrifices needed to save millions at the cost of a handful. Through it all, Boyle infuses a wonderful visual artistry to counter the heavy struggle between crewmembers and the thoughts within themselves. The use of light is astonishing as the screen is filled with lens flares, double exposures, motion blurs, stark chiaroscuro contrasts between dark and light, and the use of transparent glass to show people as reflections and also layered through the fields of light. However he created the sun, Mercury, and the spark that will hopefully create a new star, is amazing to behold. The sun is literally God-like in is construction and composition and plays perfectly into the meaning that he and Garland wanted to express. Being a psychological thriller, though, means that superb acting is necessary for us to care for these people and accept their motives. This cast does not disappoint at all. Cillian Murphy is great as usual, familiar faces Rose Byrne, Michelle Yeoh, and Troy Garity are all realistic as too, but it is the others that surprise with their emotional work. Hiroyuki Sanada portrays strength and poise of character with his stoic face, Benedict Wong is devastating as the mathematician they all need to depend on, and Chris Evans is the real discovery, showing us how good he can be. While doing films like Fantastic Four, Evans is usually the cocky funny man with one-note performances, not here though. His character is the one that understands the severity of their situation and is able to make the tough decisions for the success of the mission, no matter what the outcome of his own life. It is his mentality of self-sacrifice, at the cost of his own huge ego, that really shows what the film is about. Accepting your own death for the life of an entire world shows the strength of your being, whether or not you need God to get you to that point or not. Cliff Curtis and Cillian Murphy observe the sun. 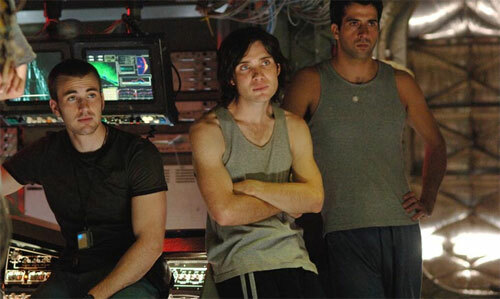 Chris Evans, Cillian Murphy, and Troy Garity listen to a debrief. Rose Byrne reads on her watch. How can the pairing of Jack Nicholson and Stanley Kubrick, right after a decade of their best work in the movie industry, fail? 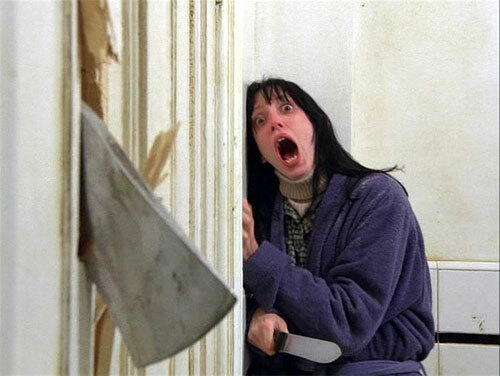 With The Shining, we get one of the best thrillers to ever grace the silver screen. There is no need for special effects or gross-out gore like the so-called horror films currently being churned out. Instead we get an amazing lead performance from Nicholson, showing a descent into the hell of insanity, and the visual genius that was Kubrick behind the camera. The best literary adaptations are those that take the source material and make something unique out of it. Film is a totally separate medium and most novels can’t be transferred word for word; books just aren’t meant to be especially cinematic. With The Shining, we are given something that is no longer Stephen King’s story. Sure the crux of the tale remains intact, but a singular mind like Kubrick allows himself to take the basics and craft them into a piece of art that lends itself to the medium being used to express it. Thus, rather than bore us with people talking to explain what is described to us in a book—like The Da Vinci Code amongst others—we are able to join this family for their winter taking care of the Overlook Hotel. The visuals speak for themselves and it is the inner turmoil and setting in of cabin fever that really takes over the story to become a force in and of itself. There are so many moments and frames of imagery that will stick in your mind for the rest of your life. Between the twin sisters and the sharp cuts to them butchered on the floor, to the blood spilling out from an elevator, to the old woman in room 237, they bring chills just reminiscing. Not to mention the crazy, what the hell just happened moments, like that of the bear and butler alone in their room, whatever evil residing inside the hotel has a keen ability to unsettle and terrorize those that threaten its motives and enjoyment. There could also be no one better to shoot the film then Kubrick and his knack for cinematography and composition. With his visual style, I still can’t believe he shot many of his movies in fullscreen format. Having the ability to shoot widescreen seems a natural fit, but something about the 1:1.33 ratio spoke to him. Along with the gorgeous angles and points of view, he orchestrates an amazing score and sound effects track. Being low to the ground as we follow young Danny Torrance on his big wheel not only puts us into the action, but the loud sounds of the wheels turning on the hardwood floor and being momentarily muffled by the area rugs along the way add a sense of foreboding and anxiousness that remains prevalent throughout. Besides the technical craft that went in to the film, we have some stellar acting performances. 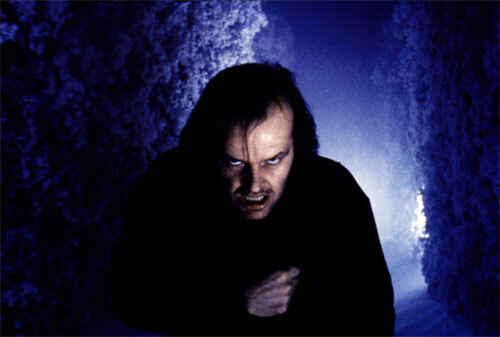 What can be said about Nicholson’s portrayal of Jack Torrance? He always holds that touch of temper hiding behind his too gracious smile at the beginning, and once we hear his wife’s tale about why he stopped drinking, you start to realize what he may be capable of. When the voices and visions projected onto him by the hotel finally seep into his head, the real fun begins. His facial expressions, tone of voice, and overall demeanor bring laughs to the audience, but they are just as much for comic reasons as they are for the viewers’ unease, smirking out of fear for what this dangerous man might do. The role could have overshadowed everything else, but the success in this film lies in the fact that all fronts work cohesively. Even the abysmal Shelley Duvall doesn’t seem too bad here. Her faces of fear are almost too real and her amateurish acting quality lends itself well to the naïve wife dutifully staying by the side of her husband. We are also treated by two wonderful turns from veteran Scatman Crothers and newbie Danny Lloyd. These two experience the titular “shining” and are able to see what force lies inside the hotel. Almost used as a defensive mechanism to try and exorcise the evil, these two show the good and the bad of their gift. Lloyd is great as the young son experiencing the horrors and visions of past murder; you almost fear for his mental wellbeing. His parents must be credited for allowing their son to partake in such grueling and psychologically detrimental moments. Whether he changes his voice to become Tony or he convulses from what he sees in his head, I have to believe Kubrick shot his scenes in a way to not let him know the full extent of what was happening in the script. Either way, Lloyd has done only one more bit of acting in his life and seems to have called it quits. He still definitely made a lasting impression on the craft. As a final note to the perfection of this movie, it is fun to see how many moments have been used later on in new films. If you are going to steal, definitely steal from the best. A couple I noticed occur during the credit sequence and shortly thereafter. While the titles are fading in we are treated with the Torrance’s car riding the mountainous roads to their eventual destination. Although Michael Haneke has put screaming music over his start in Funny Games, the resemblance is uncanny. The other moment that stuck out like a sore thumb was the psychiatric sequence with little Danny. Even with the tone of the scene and the questioning going on about his imaginary friend, it is not until Danny utters in a babyish voice that he doesn’t want to talk about it anymore do I recall the similar moment in Donnie Darko pertaining to the rabbit Frank. There really is so much to love about The Shining that I’d appropriate as much as I could as well were I to make a film myself. Brad Bird is by far the best writer/director of animated films coming out of America in a long time. Besides Hayao Miyazaki, there is no one else with the track record that this guy has. From The Iron Giant to The Incredibles to now Ratatouille, Bird just gets better and better with each new move. This new Pixar installment is definitely the most intellectually stimulating yet, but really which of his films haven’t been intelligent first, kiddie-catering second? 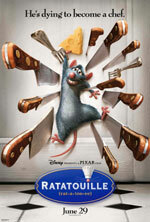 Ratatouille is by all means cinematic in scope and execution. There is nothing to this movie that screams animation besides the fact that it is a cartoon. The characters are all well fleshed out with emotions and inner struggle to survive the lives they want at the expense of that laid before them. Each frame is also composed with a sense of cinematography for real life. The expanses of Paris are breathtaking to behold and many camera movements stay within the constraints of a true machine there to capture the action. Bird’s world on display is all encompassing and you will be fully immersed into the tale, no matter what age, because it never loses its integrity or ability to surprise with its never ceasing authenticity. Pixar will always be at the top of the computer graphic echelon because they have never catered to the increasing trend of dumbing down to the lowest common denominator. It appears that the current trend in America has been to try and make everything too equal, thus simplifying things in order for those less motivated souls to understand and laugh at, at the expense of the intellectuals which should be allowed some intellectual stimulation as well. Rather than go for the “fart jokes” and clichéd old-hat humor, Disney’s newly bought animation studio has proven time and again that story is paramount and that without it, no means of skill or effects can survive. Locking up a talent like Bird for his most recent two films shows the dedication they have in getting the right people involved in the creative process. The backbone impetus of this story is not at all truly original. It is very much an ugly-duckling type tale of someone who has decided to go along a path different then his people have for generations. While being slightly ostracized at home, he goes into the world in order to find meaning and a use for his extraordinary skill. Since that skill is a keen sense of smell, what better occupation than gourmet chef is there for mixing those flavors at his service in unique and wonderful ways? Unfortunately, our hero is a rat, and we all know that they don’t go with hygienic kitchens very well. He must find a kind soul to help him do what he was born to do, and with that fateful meeting in Gusteau’s restaurant, our tale unfolds. By going against the stealing mentality of his fellow rats and living amongst the humans, I was starting to think we would eventually get to a point where his clan speaks of how he has angered the rat Gods and their supply of garbage has been cleaned up by environmentalists around Europe. I quickly hit myself in the head, remembered that this wasn’t Happy Feet with rats, and sat back to enjoy a real fairytale story that didn’t try to shove an agenda down my throat. Fairytales tell of morals and happiness and originality succeeding over prejudice and Disney/Pixar still knows how to deliver. Animation-wise, Ratatouille is a sight to behold. The fur on each rat is as tactile as that on Sully from Monsters Inc. and the liquids on display are gorgeous. Whether sewer water, Parisian streams, or blood red wine, each fluid is rendered with amazing clarity and realism. Even the human characters, something not often attempted by Pixar, are caricatured enough to make them slightly abnormal so that instead of looking at their humanistic flaws, we see them as just other animated creatures in a world of their own. Also, the set pieces are elaborate and highly detailed. The restaurant dining room is fantastically displayed and each swoop through the double doors of the kitchen brings you into a new world beyond the sinks and utensils. Even the underbelly passages of the rats are highly detailed as we go through them fast and furiously while our hero Remy runs to get above ground, going past numerous rooms that are seen through cracks—a comically French domestic dispute among them—until we get our first glimpse at the grandeur of Paris. Despite the beautiful graphics and the unobtrusively effective voice-overs—when you find you aren’t wondering who is who, you know the acting is successfully integrated into the whole—it is the story that really shines. Bird has culled his imagery from many sources, including a bit of what I feel is Tim Burton for the nemesis food critic Anton Ego who eerily reminded me of Christopher Lee, yet has made everything his own. Remy the rat must fight against his heritage and his very being in order to live his life the way he wants to. There is a lot of comedy involved in getting the human Linguini to become his friend and partner on the journey to culinary perfection, but there is even more heart behind it all. We are treated to some nicely quirky supporting roles, but none are ever put to the forefront in order to overshadow the real stars. While not the ensemble these types of films usually are, our leads are strong and never falter to the point you wish we had more of the others. I accepted the terms of the plot early on and never tired of the journey Brad Bird and company led me on. Pitch-perfect at every turn. REMY and LINGUINI in Ratatouille – 2007. © Disney, Pixar. REMY (left) EMILE (right). ©Disney Enterprises, Inc. and Pixar Animation Studios. All Rights Reserved. 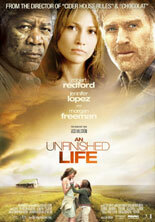 I always wondered why An Unfinished Life didn’t get the chance it should have upon its release. Between the reknowned director, in Lasse Hallström, to the top-heavy, star cast, nothing was really said about it. I remember seeing the trailer online and thinking it seemed intriguing enough, and then next I knew it was out on DVD. If it hit theatres here in Buffalo, I was not aware. Finally, though, I was able to catch up on the story and see if it deserved the lackluster response or was as good as what I had heard from friends and online. In my opinion it ended up being a nice heartfelt story about love and death and family fighting to stay together no matter what differences may be in front of them. Jennifer Lopez’s Jean Gilkyson has had enough of her abusive boyfriend and decided to leave him. Having nowhere to go, without him finding her, she resorts to going to her father-in-law’s ranch in Wyoming. The two haven’t seen each other since her husband/his son’s funeral. It is a last ditch effort to find a place of safety and her daughter gets to finally see a glimpse into the life of the father that she never had a chance to meet. There is a lot that goes on in this film to keep track of besides just the awkward homecoming and attempts to thaw a decade of blame and anger. Where Einar Gilkyson refuses to accept that his son’s death was an accident while his daughter-in-law was driving, she can’t allow herself to feel like she deserves someone better than an abusive figure in her life, whether verbal or physical. Her guilt and knowledge that her love was gone has trapped her into a life of going from one bad guy to another. It is all up to the daughter to unknowingly bridge the gap between these lost souls and make them see the truth—that they are still family and they both loved Griffin more than anything in the world. They just need an excuse to find that out. Along with this main plot thread comes the search by the abusive boyfriend to get his girl back, the local waitress who plays an integral role in the Gilkyson’s lives, and a bear who, one year removed from mauling Einar’s friend Mitch, has been captured and entrapped at a zoo. A lot of healing is necessary for this film to conclude and a lot of secrets and unearthing of everyone’s guilt for some mistake they have made in the past are brought to the surface. Characters begin to discover that the reasons they are angry with others is because they themselves have been in that situation before. They need to forgive themselves to be able to forgive the others because if they can’t accept the pain of what they did, no one else will be able to deserve it in their minds either. If there was one word to describe this film, it would be forgiveness. While the script and story are very well done and interesting, it can get a bit long, especially towards the end. In order to tie up the loose ends of the ancillary storylines, we are given a few fadeouts and tacked on sequences once the main plot has been concluded. Those side tales, that enhanced in the beginning, begin to be a burden because they have been invested in so heavily that we need some closure there too. If there was a way for that to have happened before the conclusion of the main focus it might have been better because the audience wouldn’t be wondering why they are still watching when the big problem has been reconciled. The cinematography helps keep interest, though, because the still moments that could seem too long end up showcasing some beautiful country scenes and interesting compositions of frames. The real joy of this movie, however, lies in the acting. I’ve never been a fan of Lopez, but she does prove here that she has some nice range and skill as an actress. It is just a shame that she rarely picks projects other than mundane romantic comedies. I am a fan of both Josh Lucas and Damian Lewis, and both do a great job as the polar opposite love interests to Lopez’s character. Lucas is more of a general role with not much to do, but Lewis has some work as the abusive boyfriend who can fly off the handle at any second with little provocation. Becca Gardner is pretty good as the young granddaughter in the middle of everything. There are some moments that show she is new to the craft, but they don’t seem quite too out-of-place for who her character is. Also, both Robert Redford and Morgan Freeman show how good they are at portraying what is needed at all times. Freeman is the voice of reason in their friendship and he must show happiness, pain, disappointment, and hope throughout. As for Redford, he really impressed me as the cantankerous old man who has finally started to accept the fact his son is gone, but has it all come back at him with the arrival of his guests. This has made me want to check out some more of his older films, Sting-era. I haven’t seen much of his work besides from the past few years. Robert Redford (Left) and Morgan Freeman (Right) star in Lasse Hallstrom’s ‘AN UNFINISHED LIFE.’ Photo courtesy of Doane Gregory. Jennifer Lopez, Robert Redford, and Becca Gardner in Lasse Hallstrom’s AN UNFINISHED LIFE. Photo courtesy of Doane Gregory. For starters, Harry Potter and the Order of the Phoenix was by far my least favorite book in the series. 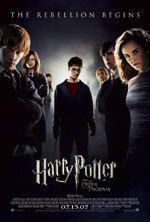 Not much happens until the end, which is actually pretty good, there is a lot of repetition through the beginning of the story, and Harry’s adolescent anger and temper just get plain annoying. After enjoying how the fourth book was adapted onto film, I was hoping we’d get more of the same here with a distilled version where main plot is paramount and the detentions and acting out cut down immensely. At first I thought I was going to be very happy. The film starts off great with Dudley and Harry in the London playground where the Dementors attack. Just having a sequence in a Potter film outdoors and not at Hogwarts was a welcome sight and everything pretty much went as planned. There were some exclusions when the boys arrived back home, most noticeably the absence of Mundungus, but I was willing to look past them. Even in the early time at Hogwarts, Potter has one outburst of anger and it seems that would be it. I was ready to ease into the tale and enjoy the ride, but that comfortability never occurred. I will say that the acting was par for the course. We have a few new characters and as a result see less of those we have come to love. McGonagall is almost nonexistent—which means her attack is not used here—and she was the one person who stood up against new teacher Dolores Umbridge; Draco is a blink and you’ll miss him role; and the Order itself are hardly seen until the climatic ending and that’s a lot of decent paychecks for little work. Even Hermione and Ron have their roles shrunk in order to keep a big spotlight on newcomer Imelda Staunton’s Umbridge. She is the main antagonist of the story so I understood the large focus on her, and Staunton is wonderful in the role. My problem was that she was made into an evil witch. In the book, although misguided in her thought process, she was not a vicious psychopath as she is shown to be here. Umbridge always did what she thought was right and allowed by the Ministry of Magic, however, her cinematic counterpart turns about halfway in, once her power is increased at the school. She becomes a monster doing anything she wants, at one point physically abusing a child, and even about to use the Cruciatus Curse on a minor, (I don’t quite remember that one happening in the book, although I could be wrong). Maybe the reason I disliked the book was because she wasn’t evil enough and Potter couldn’t necessarily justify his anger, and in that regard, maybe the filmmakers needed to up the ante. However, by seeing this new incarnation, I have to say her wrong decisions in the novel were more believable because at least she thought she had her mind in the right place and wasn’t just being a vindictive crazy woman. If I need to blame anyone, it will have to be first time Potter scribe Michael Goldenberg. It seems as though he didn’t read the sixth book and decided to adapt this one without care for what he was leaving out that may be important later, not to mention how he treats some of the characters he keeps in. What was my least favorite book has now become my least favorite cinematic entry as well. Even when Chris Columbus gave us two mediocre paint-by-numbers films at the start, they at least stayed true to the books. With this newest one, the tone has shifted, most of the good parts were missing, and now the next film will probably need extra explaining to fix the mistakes made here in continuity. From the screenwriters of the Chronicles of Narnia: The Lion, the Witch, and the Wardrobe comes the R-rated black comedy You Kill Me. It’s an odd pairing, but at least you can say these guys have range. To helm this film, about a hitman whose drinking problem has caused sloppiness and perhaps the demise of his Polish gang in Buffalo, we have John Dahl. I am a huge fan of Rounders, so I was hoping for some of the same here, with a dramatic arc that worked and made sense intelligently, but also bringing the laughs that the trailer promised. Thankfully this film doesn’t disappoint. Yes, there are some moments of disbelief, but the dry, straight-laced delivery of everything else makes up for the leaps in logic that would otherwise eat at me for the duration. While not laugh-out-loud funny, Dahl has put together a nice slow burning comedy that allows its characters to live and breathe realistically and evolve in a somewhat believable manner. Our aforementioned hitman is played brilliantly by Ben Kingsley. I remember when I used to look at him as just Gandhi, but after the diverse catalog of films he has done recently, I’ve realized that he isn’t afraid to branch out into darker fare. His role here has a lot going for it in comedic terms—he is an alcoholic, a loner that kills for money, and a resident of the arctic pole of Buffalo. Put all that together and you can think of a few funny situations for him to get into. To the filmmakers’ credit, though, we never really get any of that except for the opening “job.” When Kingsley’s Frank sleeps through the one big job he is relied on to do, everything falls apart. What happens next is his journey to sobriety and friendship/love to pull him through to an understanding about what he really is living for. What worked for a film like The Matador couldn’t be as effective here. Frank isn’t having a nervous breakdown or losing his cool, he is off the job seeking help so that he can go back on the payroll. We don’t need him to drunkenly wave a loaded gun at people, the comedy instead comes from his fish-out-of-water situation, being a cold-hearted killer trying to warm up to recovering alcoholics and a community he is not used to being sober around. Kingsley definitely plays the role to perfection, never faltering from his matter-of-fact tone or takes no crap attitude. Everything out of his mouth is carefully orchestrated and he is not one to waste his own or others’ time. This fact makes some scenes hilarious because of the reactions from those he is speaking to. When he speaks from the heart and seriously, while sprinkling in his own experiences murdering people, during AA meetings, the utter silence and occasional Amen from the audience is gold. Besides his unfaltering demeanor and his sardonic sarcasm, it is when he plays off of love interest Téa Leoni when some of the best laughs occur. These two have a wonderful rapport and when they go at each other rapid fire, with one quip/comeback after another, you’d think it was all ad-libbed—the timing is that good. Leoni has been surprising me lately with her career. I don’t know why I used to think she was annoying, but recently having seen films like House of D and her early work in Flirting With Disaster, I realize that she is good at both the dramatic and the comedic. The who’s who of supporting players also does a nice job anchoring the story. Luke Wilson seems to really just be playing himself, but the laidback friend is what is needed for the role. Philip Baker Hall and Dennis Farina show how it’s done as two rival mob bosses in Buffalo, (yes, I said mob bosses in Buffalo, I’m constantly scared for my life when walking around downtown at night). Their storyline is handled well and counteracts the subtle humor going on at rehab in San Francisco with some tense moments trying to keep the Polish afloat at the hands of the ever increasing Irish crew. Mention is also needed for Bill Pullman who has been making some good choices of late in small supporting roles. His self-absorbed real estate agent is entertaining because his ego won’t let him be intimidated by the killer he is conversing with. The laughs may not come over and over again, but when they do it’s smartly and appropriately. The fact that everyone in San Fran who hears Kingsley is a hitman just accept it like someone saying they washed their clothes that morning is a bit rough to get by, but really it doesn’t matter in terms of plot progression. The writers also try to distill the problem with Frank saying how it’s Alcoholics “Anonymous,” which brings a smile to your face for nothing more than the corniness of the line. I also don’t know how perfect placing the movie in Buffalo was. It seems the writers needed a cold, drinking town up north and our wonderful home of Buffalo was the first to come to their heads. When was the last time you heard about the Irish and Polish mob going to war while the Greeks stood back to see who came out on top? Yeah, that’s right, never. I did like the touch of hometown words by naming an Irish bar Scajaqueda. Just proves again these guys had no clue what they were doing with location. Overall, though, the film works despite any of its shortcomings. No matter how big an Adam Sandler fan I am, I will admit that most of his films are crap. I don’t mean the three “serious” movies he’s done, as I have liked or loved all of them, I am talking about the comedies he helps produce. After hitting the ball out of the park first time out with Billy Madison, one of my favorite stupid comedies ever, he has been hit or miss, with a lot of misses. Luckily most often than not, he follows a letdown with a winner. I’m not saying Happy Gilmore was a letdown per se, but it is not one of my favorites of his. 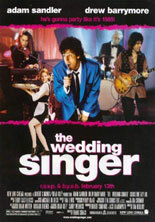 However, right after came the 80’s pop culture referencing The Wedding Singer. While not the funniest of his films, it balances the sentimentality, the heart, and the laughs better than any of his work. I could truly watch this movie anytime it is on tv; it never gets old. The story is not an original masterpiece as we have Sandler’s character falling for a girl who is engaged to a jerk/adulterer. We all know how it will end up, so it is the exposition and the plot progression that needs to work in order to sell us what will ultimately happen. This one hits all its marks flawlessly. Between the crazy scenarios that our main characters end up intertwining themselves in, to the fantastic soundtrack, to the clothing and technological advances of the decade being sprinkled throughout, to the genuinely priceless singing scenes, it all works. The opening wedding helps start everything out on the right foot with a great cover song, a cameo by Steve Buscemi which is hysterical, an introduction to all our main players and where they are in their lives, and many big laughs. Counter this with Sandler’s next gig, while depressed beyond belief, and you have two polar opposite situations that deliver the goods with equal success. All the performances work and it is the cameos that sometimes overshadow the leads. 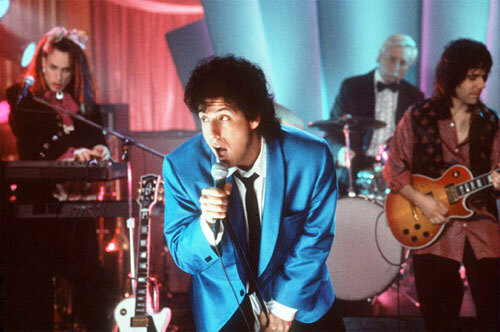 Adam Sandler is probably at his best here as far as comedic roles. Unlike his previous efforts, portraying dimwitted goons that speak like they are mentality deficient, here he shows some nuance as a character with fully fleshed out motives. His Robbie Hart is a guy that people can relate to; a nice guy trying to show that sometimes even they can finish first. Drew Barrymore is the weak link as usual. She is brimming with happiness and possesses a cheery disposition, but she just isn’t a terribly good actress. For a role like this she is not too bad, especially in parts where she is allowed to just go with it. When Barrymore and Sandler are getting price quotes for wedding photos and pretend to be brother and sister, there is a real moment that almost makes her seem natural. Unfortunately, most times she just looks like she is trying to act and therefore coming off as unnatural and awkward. As said before though, it’s the cameos that steal this film. The aforementioned Buscemi is top-notch as usual in Sandler-fare, Jon Lovitz—who generally annoys me—is very funny, Billy Idol is classic, Christine Taylor effective, and Allen Covert shows why Sandler puts him in almost all his films. I don’t quite know how these two met, but it seems that they are pretty good friends and it comes across onscreen. He is the confidant, the ying to his yang, the comic relief, and the voice of reason at some point during the film. It is interesting that he has never had this prominent of a role in a Sandler-vehicle since, because he does a great job with this one. I am a big Tom Tykwer fan. Between his latest, Perfume, his short in Paris, je t’aime, and the wonderful directing of Heaven from the late Kieslowski’s script, I must say he is unafraid to use any technical ingenuity he can think of. This type of delving into mixed genres and cinematic senses needs to start somewhere though, and that start is Lola rennt. This film is an adrenaline rush for the entire duration being driven by the pulsating techno/electronica beats behind all the action. From straight film to animation to freeze-frame montages of photographs, Tykwer never lets the viewer get bored. Even the script stays witty and poignant at the same time, portraying the love between our two leads as well as the crazy situation they have been thrust into. The film knows it is unbelievable, yet never uses it as a crutch. It shows us early what we are to expect and it never disappoints. The crux of the story is that Lola’s boyfriend Manni has lapsed during his getaway from selling stolen cars. He gets scared on the subway when he sees the cops and accidentally leaves his bag of 100,000 marks on his seat to be stolen by a street bum. Blaming Lola for not being where she was supposed to be to pick him up, he calls her for any ideas on how to save his own skin. The problem, though, is that he needs to get the money before twenty minutes are up or his boss will kill him. Here begins the film and Lola’s running to get the money from her bank manager father before Manni holds up the grocery store he is at. During her journey, she passes strangers and learns secrets from people she thought loved her. Tykwer brilliantly shows what happens to these people in quick-paced montages of photos on their activities in the near future. Depending on what happens when they encounter each other, though, this look into the future is not set in stone. How do they get to meet for the first time more than once? Let’s just say Tykwer is not afraid to mess with life, death, and time in order to get his point across of love conquering all. Besides the innovative camera techniques and the humorous dialogue and plot situations, the acting doesn’t falter either. All the supporting players know their roles and play them to full effect in order to complement our two leads. As for them, Moritz Bleibtreu fully encompasses the role of the up-and-coming criminal who’s fear and lack of confidence seem to get in the way of his lofty goals and Franka Potente never slows down in her portrayal of Lola. Potente is that girl who has rebelled against her more stuffy family, dyed her hair bright red/orange, tattooed herself, and fallen for the bad boy thug. Despite the lifestyle however, both of these characters are very much good people at heart, willing to do anything for each other in order to stay together. The cut scenes that bridge both moments of time travel help show this humanity. In bed, probably after making love, the two talk about what they truly mean to one another and whether love is true and if it will last after death. Tykwer has crafted a film that was totally fresh at the time it came out. This German gem could be seen as a precursor to films like Crank and The Transporter. By no means are they similar in subject matter or violence and action, however, the use of music and fast editing in order to create a non-stop ride for the audience is prevalent in both. 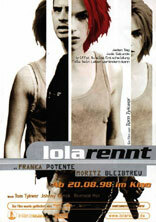 Lola rennt is an amalgam equal parts romance, comedy, action, and thriller, but also a 100% fantastic spectacle.